Sponge Filters can serve as mechanical pre-filters trapping larger pieces of debris before entering HOB power filters or canister filters. Sponge Filters are also used as biological filters. 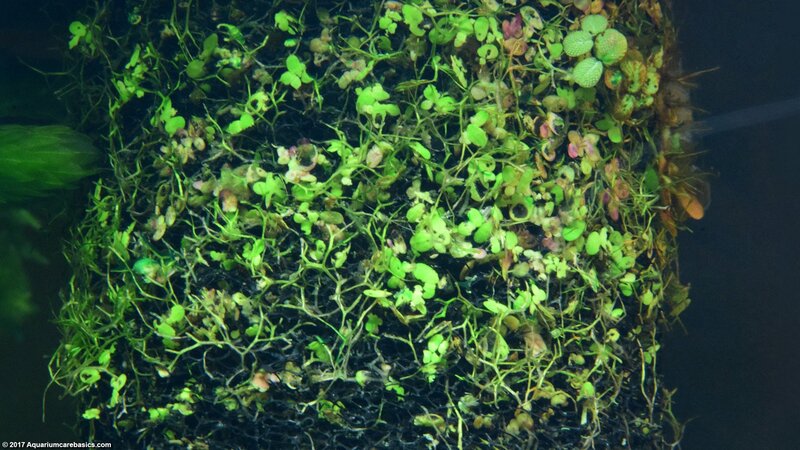 Their large surface area increases the space on which nitrifying bacteria can grow. This good bacteria is beneficial in an aquarium. It is necessary to convert Ammonia to Nitrite and Nitrite to Nitrate. Cleaning a sponge filter is easy. Just rinse the sponge filter in a bucket of aquarium water. Squeeze it gently to remove the debris. Larger pieces of debris will come off the side of the sponge and fall to the bottom of the bucket. The smaller pieces of debris will float in the water. Its also a good idea to have a couple of sponge filters on hand in case fish or shrimp start having babies. 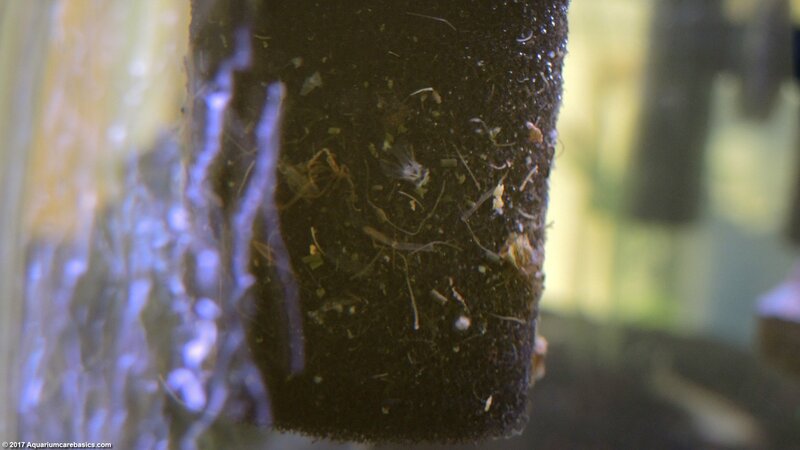 Fry or larvae can easily get caught in the current and meet their demise as they get sucked up into external filters. 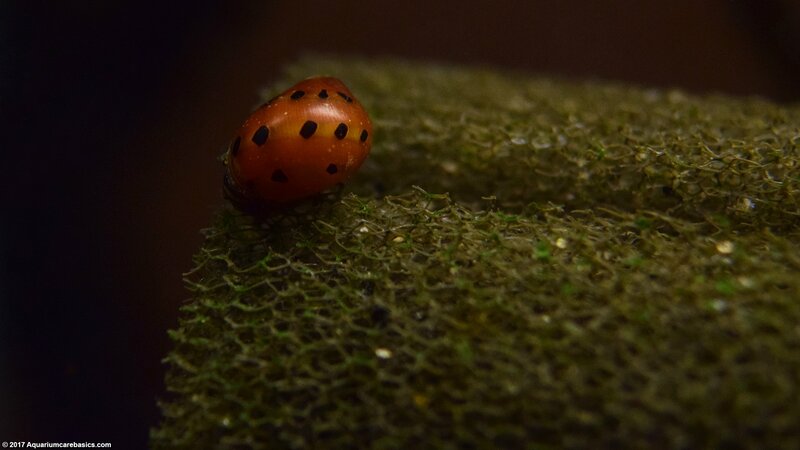 Fine sponge filters placed snugly over the filter intake can help prevent this. 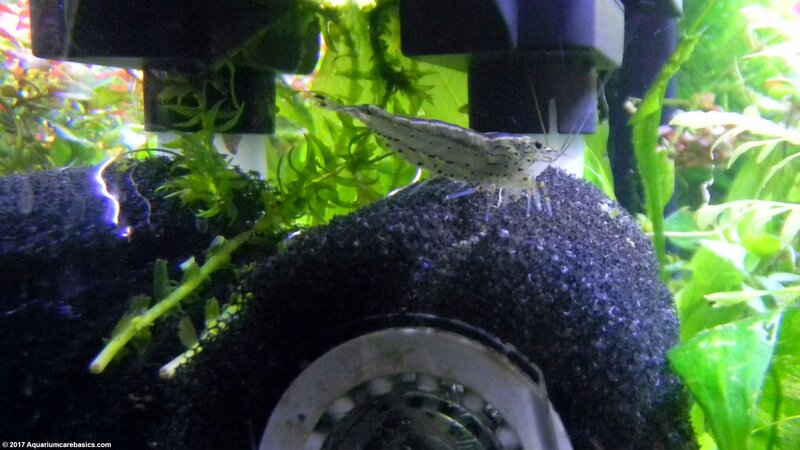 Amano Shrimp are very ferocious pickers. Scavenging for food is their forte. 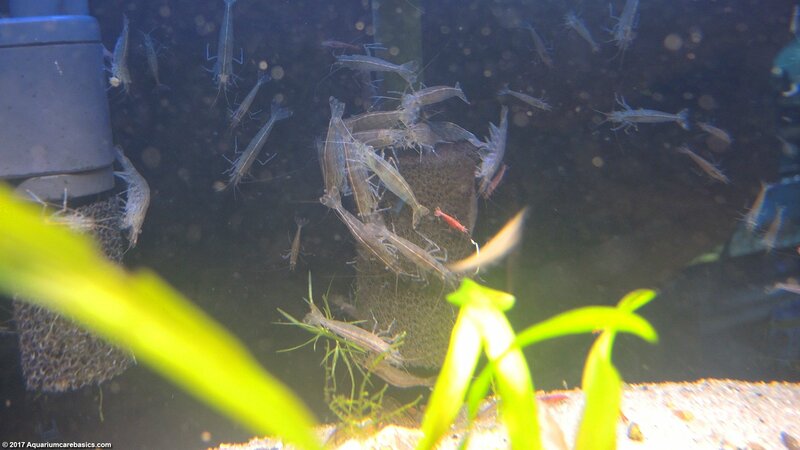 Amano Shrimp like searching through small places and sponge filters provide the perfect spot. Sponge filters trap little bits of edible materials like uneaten fish flakes, pellets and algae wafers, dead plant matter and detritus. 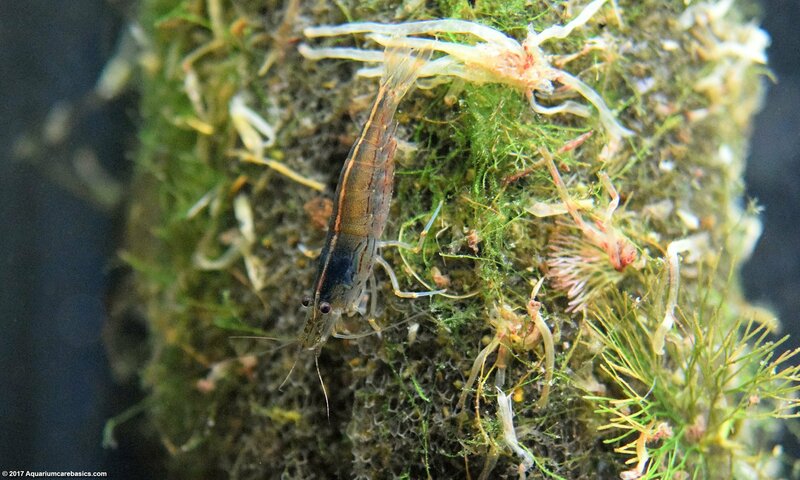 Because Amano Shrimp are so adept at finding little pieces of food, they are considered to be some of the best freshwater tank cleaners available to aquarium hobbyists. They are tank cleaning team mates are Nerite Snails. Larger shrimp like picking through sponge filters on the course side, and smaller shrimp seem to be more interested in a fine sponge filter with smaller textures. 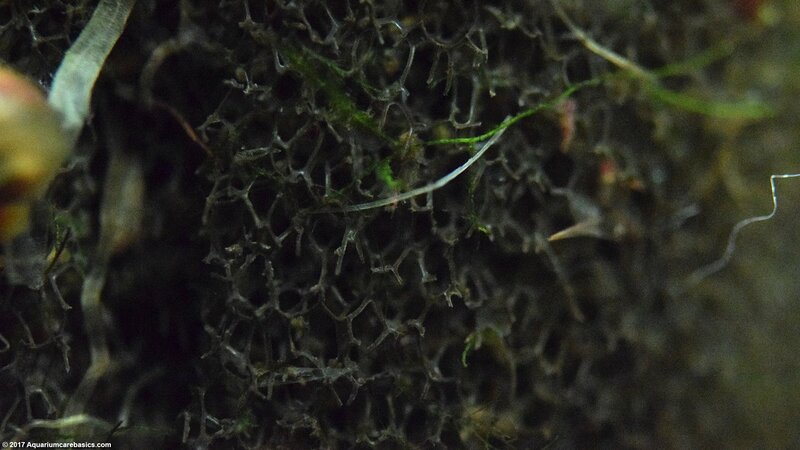 But either way, the sponges provide shrimp a place where edible material accumulates. 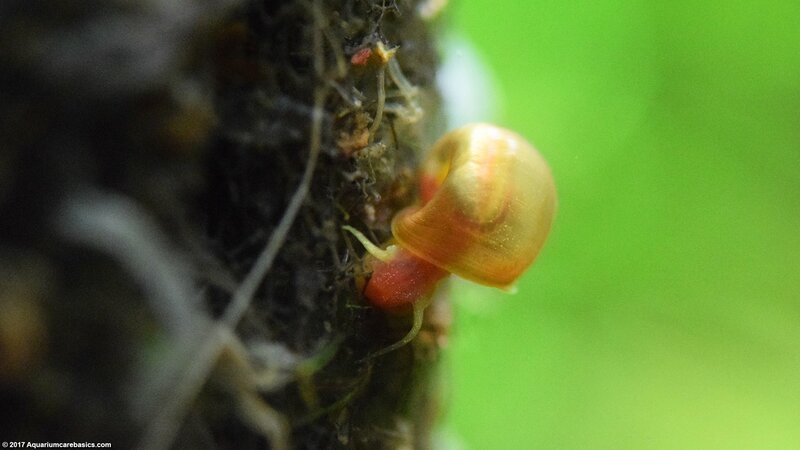 Even though a sponge filter is porous, Nerite Snails, Red Cherry Shrimp and Ramshorn Snails frequently cruise the surface searching for bits of trapped edible material to ingest. The enormous surface area of a sponge filter offers alot of space to find food to eat.